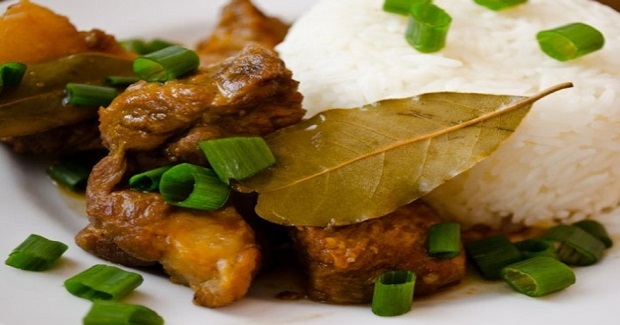 Adobong Manok And Liempo Recipe - Gutom Na! Posted on Friday, September 9th, 2016 at 1:54 pm. Marinate chicken and pork with the garlic, soy sauce, vinegar, laurel leaves, and pepper for five hours. Transfer to a saucepot, add water. Let boil, then simmer until the liquid is reduced to half. Cool completely. Separate the garlic and the meat from the sauce. Heat the oil until hot in a frying pan. Separately fry the garlic and then the meat until crispy and chewy. Put the meat and garlic in a deep saucepot. Add the sauce. Continue cooking over high heat until sauce has thickened and the bottom burns a little with very little sauce remaining in the pot.